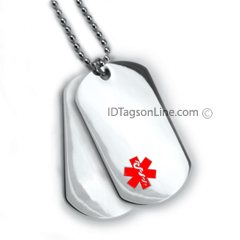 Double Medical ID Dog Tag, IDNS32 (1 1/8"x2"), is made from two .050" thick premium Non-Allergic Stainless Steel Tags. It is guaranteed to be rust free for the life. Red enameled medical logo is embossed on the front of the top tag. You can choose Blue or Engraved emblem or Blank one (without emblem). We can engrave 20 lines total (20 Characters Max. in all lines) of personal or medical information on both Dog Tags. It would be 2 lines of the front and 6 lines on the back of each dog tag.